Following this event, temporary structures started springing up at protests across the United States as part of a coordinated effort to Occupy Sukkot. Facebook pages were created to arrange for the provision of sukkot, lulavim and other ritual objects necessary for Sukkot observance. Sukkot were raised in cities with large Jewish populations like New York and Los Angeles, and in smaller Jewish enclaves like Seattle and Portland. 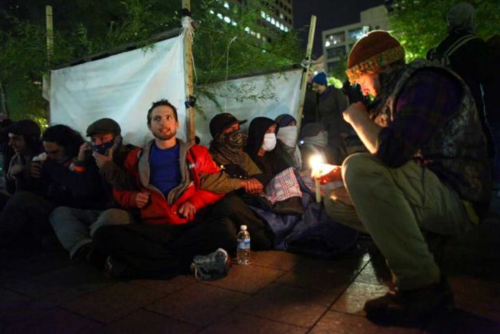 The connection between Sukkot and the Occupy Wall Street movement was a natural one. Writing for the Huffington Post, Rabbi Ellen Lippmann of Kolot Chayeinu explains: “For the newly or long-time homeless, the sukkah provides shelter. For those in danger of losing homes, the sukkah is a fragile home that nonetheless stands firm. For those who have lost jobs, the sukkah offers a bountiful table for all, old and young.” For eight days the sukkah became a powerful symbol of the Occupy movement, and of the Jewish resolve to stand on the side of justice in the face of adversity.